Today, we have another new look at the upcoming feature adaptation of Veronica Roth's young-adult dystopian novel Divergent. Following the reveal of the film's version of the various faction symbols and a glimpse of star Shailene Woodley standing on the ledge of a building, we have our first up-close look at Theo James' character "Four." 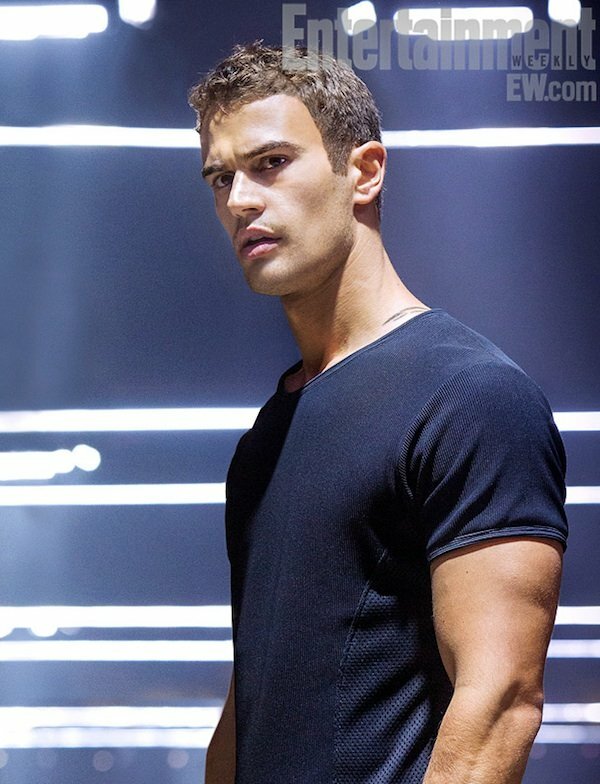 Thanks to EW, we now have our first up-close look at Theo James' character, Four, one of the Dauntless trainers and the male lead character, who forms a bond with Tris. The photo gives us a little glimpse of one of his tattoos, which can be seen up near his neck. EW says this photo is from a scene early in the film when he's showing the Dauntless initiates around the headquarters. Roth actually wrote a 16-page ebook called "Free Four", which tells the knife-throwing scene from Four's perspective. It offers some interesting insight into the character's mind, if you've already read Divergent. Directed by Neil Burger, Divergent is set in Chicago in the future where people are divided into five factions, based on their personality, which determine their way of life. The story begins with Tris (Woodley) learning that she's "Divergent," which means she's not cut out for any one faction. This condition is something she needs to keep secret as she chooses her faction and begins her training to find her place among her people. The film is set to arrive in theaters March 21, 2014. In addition to Woodley and James, it stars Kate Winslet, Maggie Q, Jai Courtney, Miles Teller, Zoe Kravitz, Ansel Elgort, Ben Lloyd-Hughs, Ray Stevenson and Tony Goldwyn. If you haven't read it yet, Amazon has the first book in the soon-to-be trilogy (Allegiant comes out this fall) for $5.99.